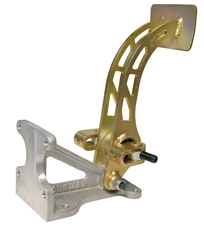 This precision brake pedal is designed to take the slop out of the pedal assembly giving a much tighter pedal feel. The balance bar features special bushings that eliminate excess movement of the clevis yokes, the pedal features two precision machined bronze bushings and a shoulder bolt that is pressed into the brake pedal base. Eliminating excessive clearance in these areas reduces unwanted pedal travel by 1/4" to 3/4", giving a much better and firmer feel of the brake pedal. "WARNING: This product contains a chemical known to the State of California to cause cancer and birth defects or other reproductive harm."